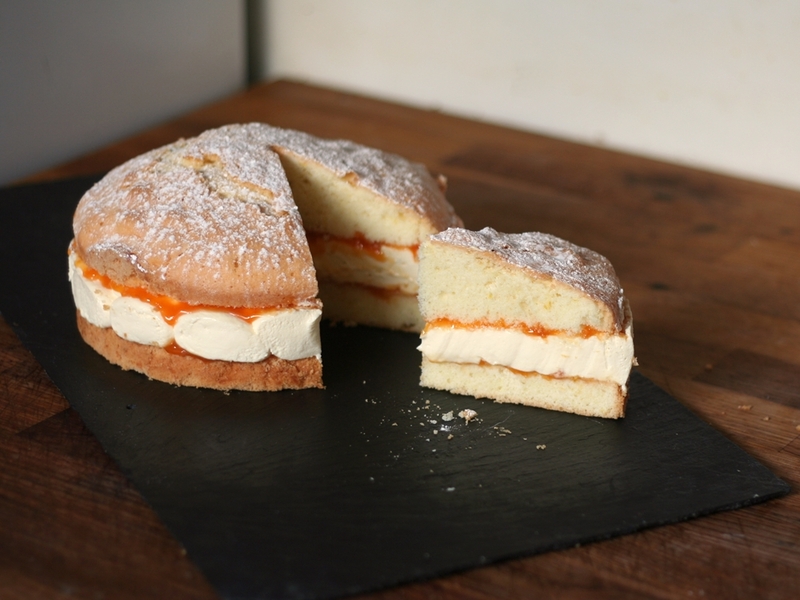 An unusual and simple cake for you this week, with the bonus of being gluten-free! Following on from the gluten-free Brazilian Cheese Breads of last week, it might look as if I’m following a theme here, but I assure you it’s juts a coincidence – a DELICIOUS coincidence! Last week, I got a request from my publisher to write a short paragraph for publication on their foodie website, on my favourite baking book. As you can imagine, with my book collection, this took quite some time to narrow down. As I was perusing the shortlisted books, I came across this recipe – not in any specific allergy-related book or even chapter of a book. No, it was just included with a bunch of other recipes in a book aimed at the commercial baker, dating from the early 20th century. I have scaled the recipe down from the originally huge quantities, but otherwise, it is unchanged. This cake is made using potato flour. IMPORTANT: Potato flour is made from RAW potatoes and is a bright white and very fine powder, with no discernible taste. It is NOT dehydrated cooked potato, which is coarse, yellowish and tastes of potato. That makes mashed potatoes when reconstituted and will add a similar texture to your cake. Readers in the US: use potato starch flour. At first, I thought the cake got its name from it colour, because, as you can see from the photo, it is indeed a very pale cake. However, after tasting the cake, I’m now of the opinion that its name comes from its texture. It has the same quality of settled snow, in that there is a thin ‘crust’ on the top and soft, friable, almost powder-like substance underneath. The cake dissolves in the mouth – but in a different way to, say, Melting Moments. 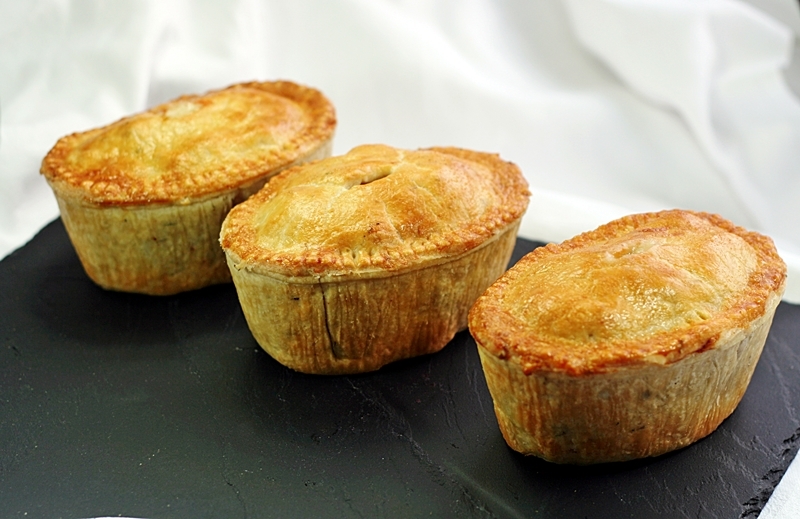 It’s incredibly light and tender and is best enjoyed simply, where it can really shine. That said, the cream that I have teamed with it is pretty awesome itself. It is a variation of the filling I used for the mille-feuilles in the final of The Great British Bake Off. The mixture of sweetened cream cheese and whipped double cream is given a firmer set by the addition of gelatine, which helps to hold in the moisture and makes for a very luscious, rich, creamy and mousse-like texture. Just to continue the frozen theme, it’s like the very best soft-serve ice-cream, without the cold. I’ve brightened the filling with some of the Apricot Jam I made a couple of weeks ago, but any other sharp jam would also work well. I bought the potato flour at Holland & Barrett. Grease and line the base of a 20cm diameter, tall cake tin – not a sandwich tin. The high sides will help shield the cake from the direct heat of the oven and keep it from becoming over-coloured. Beat the butter and sugar together until light and fluffy – 5-10 minutes. Add the eggs one at a time, beating well each time. Add the remaining ingredients and beat thoroughly – a good 5-10 minutes. Ordinarily, you’d run the risk of over-beating a cake mixture, which would develop the gluten in the flour, leading to a tough cake. Since the potato flour has no gluten, there’s no need to worry about this. You want to try and get as much air into the mixture as possible to make for a light texture in the cooked cake. Turn the mixture into the prepared tin and smooth the surface. Bake for 20 minutes, then turn the tin 180 degrees and bake for a further 10-15 minutes, for a total of 30-35 minutes. When you turn the cake after 20 minutes, slip a sheet of baking parchment over the top of the tin to keep the colour from getting too dark. When cooked, remove from the oven and let rest for 10 minutes, then remove from the tin and cool on a wire rack. Soak the leaves of gelatine in cold water for 15 minutes. Warm the double cream and caster sugar until the sugar is dissolved. Shake off the excess water from the gelatine and add to the pan. Stir until the gelatine has melted, then remove from the heat and set aside. Once the mixture has cooled a little, pour it into a bowl and add the remaining ingredients. Whip the mixture until the cream has thickened and it is soft and pillowy. Even though this is a light sponge cake, the weight of the top half will be too heavy initially, to avoid squidging (technical term) the cream out of the sides of the cake. Therefore, I strongly recommend using the following method to assemble your cake. Using cocktail sticks, mark the midpoint of the cooled cake around the edge and cut it horizontally. Spread the cut side of each cake half with apricot jam. Put the bottom half of the cake back into the tin in which it was baked. Slip a band of parchment or food-grade acetate around the inside of the tin, between the cake and the inside of the tin. Smooth or pipe the cream filling over the bottom of the cake, making sure it reaches the edges of the cake. Place the other half on top and press gently. Cover with cling-film and chill for 2-3 hours, until the gelatine in the cream has set. Remove from the fridge and allow to come to room temperature. Remove the cake from the tin and gently peel the parchment/acetate from around the filling. Smooth with a knife if necessary. This week’s recipe is another great comfort food and snack item that originates in eastern Europe, and migrated from Russia, through Germany and travelled with the food traditions of German immigrants to North America. Variations are also known as Fleischkuche, Runza’s, Kraut Pirok and Cabbage Burger. 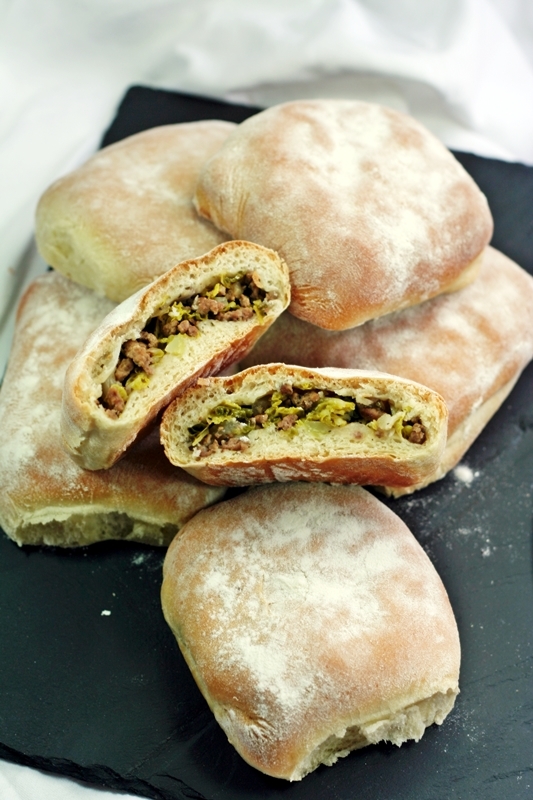 A soft, white bread dough is stuffed with a mixture of seasoned beef mince, onion and cabbage – and that’s it. You’re thinking it sounds a bit plain and dull? Yes, me too when I first read about these, but reading the reviews of these buns on recipe sites and blogs, you discover that these simple stuffed rolls have a huge fan base out there – so much so that they are made commercially in the US. The mix of meat, onions and cabbage is moist and savoury and comforting. Sometimes the most flavourful things come from the simplest of ingredients. These rolls are best served warm, and served with salad they can be a simple and tasty lunch. Alternatively, they also freeze well – great for grab-and-go weekday lunches, they will have defrosted by lunchtime can be warmed up either in an oven or microwave. Although the basic recipe is delicious, you can also add a little extra flavourings to your taste. The most popular variation includes a little sauerkraut with the cabbage: I personally wasn’t keen, but then I only had shop-bought sauerkraut to try it with. Home-made sauerkraut is probably much better. The second variation I tried was to add a little cheese. I went with some grated Grana Padano (a strong Italian cheese similar to Parmesan, but much cheaper) for maximum flavour without adding too much bulk to the filling. I really liked this little addition, but please do try the original mixture too – it really is delicious. You can use any cabbage, but I like both the colour and texture of the Savoy cabbage – it holds its colour really well and makes the filling look fresh and juicy as well as taste that way. Put the flour, yeast, egg, salt and sugar into a bowl. Add the boiling water to the milk and add gradually to the mixture until it comes together into a soft dough. You may need more liquid, depending on the moisture in the flour and egg. Knead the mixture for ten minutes, cover and set aside to rise for an hour. Heat a non-stick saucepan over a medium high heat and crumble in the meat. No need to have any oil, even lean mince has a certain amount of fat in it which will come out as the meat cooks. Stir the meat around until it is browned and shiny. Add the onion and continue stirring while the onion softens. Finally add in the cabbage and cook until the cabbage has softened – probably no more than 2-3 minutes. Stir in the salt and pepper, remove from the heat and set aside to cool. When the dough is risen, tip out and pat down. Divide dough into pieces weighing 75-80g. Roll dough out into a 15cm square. Put a measure of the cooled filling into the middle of the dough. I use an 80ml measuring cup. Add 1 teaspoon of the grated cheese, if using. Bring the corners of the dough together and pinch along the edges to seal in the filling. What you will end up with looks like the back of an envelope. Turn the buns over and place onto a parchment-lined baking sheet. Dust the buns with flour and set aside to rise for 15-20 minutes. Bake the buns for 15-20 minutes until lightly browned. Remove the buns from the oven and immediately cover the baking sheet with some tea-towels. This will trap the heat and create steam, which will soften the crust of the buns. So, it’s that time of year when the Seville Orange crop brings a splash of colour to the fresh produce section. It’s marmalade season, especially for those of a competitive nature, because The World’s Original Marmalade Awards are accepting jars for their annual competition. Thousands of marmalade lovers participate in this popular contest, including myself last year, where a jar I made following an 1840 hand-written recipe won a gold award. Have a bash yourself – it’s worth it for the fabulous feedback you get from the judges (yes, they send comment cards for every single jar that is entered!). There’s even a section where it doesn’t matter what the marmalade tastes like, because the prize is for the label design! I’m not suggesting any marmalade recipes here, rather some ideas for what to do when that initial enthusiasm wears off and the sacks of Seville Oranges you gleefully purchased at the start of the season are still sitting in the fruit bowl and Stuff™ has eaten up all of your spare time and got in the way of your marmalade plans. This happened to me a few years ago, and here is my suggestion for dealing with a mound of Seville Oranges and no enthusiasm/time/jars to make marmalade. First of all, don’t throw the oranges away. Grate the zest, then cut them open and squeeze the juice. Mix all together and pour into large ice-cube trays and freeze. When frozen, seal them in a ziplock bag. Each frozen cube is roughly equivalent to one Seville Orange, so it’s easy for later use, for flavouring curds, cakes, icing, custards, tarts, ice-creams and savoury dishes. The strong, bitter-sharp flavour packs a real punch that sweet oranges just can’t match. And, of course, they make an amazing curd. Even on the years where I make marmalade, I make sure I stock up on Seville Orange ice cubes so that I can enjoy some Seville Orange curd throughout the year. Before moving on to the recipe, let us pause a moment and talk butter. Specifically, clarified butter. Clarified butter is butter that has had all the imperfections and unnecessary ingredients removed so that all you are left with is the very purest form of butter. Many of us might be familiar with the Indian cooking ghee sold in distinctive green tins in the UK. The ghee from these tins has a wonderful, perfumed aroma which immediately brings to mind the warms spices of India, and I do try and ensure I always have a tin in the cupboard for spur-of-the-moment curries. However, it isn’t necessary to buy all your clarified butter because t is simplicity itself to make your own. In the context of this post, clarified butter is definitely the only choice when making fruit curds and will extend the shelf-life of your fruit curds drastically. 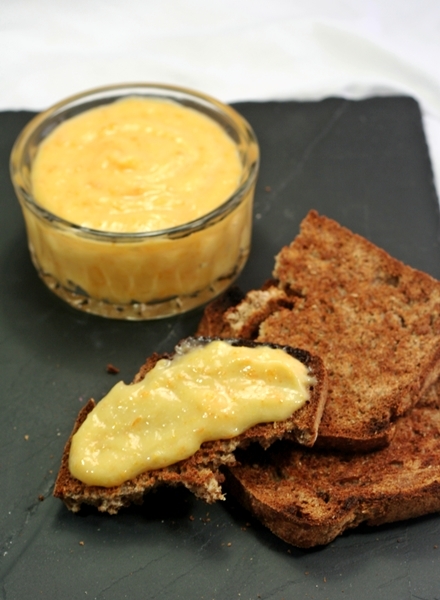 You might think it a faff, but if you do make a batch of clarified butter, it will keep in the fridge for weeks and is therefore on hand, not just for curd, but also for lots of other cooking uses. Melted butter separates itself into three distinct layers: the top layer consists of little pieces of casein that float on the surface, the middle layer is the butter itself, and the bottom layer is composed of all the milk solids and salt that are present in regular butter. The middle layer is the only one we want, the rest can be discarded, and without the casein and milk solids, there’s nothing left in the clarified butter to spoil or go off. Put the butter into a small saucepan and set it on the lowest possible heat. Leave it until completely melted and the milk solids have sunk to the bottom. Don’t stir. Turn off the heat and let it cool for 15 minutes. Skim the debris from the surface, the either pour or spoon the clarified butter into either a jar or a seal-able plastic box. Don’t let any of the milk solids become mixed with the clarified butter. Stop pouring when this looks like happening. Cover the clarified butter and allow to cool. Store in the fridge. Pour the remaining butter and milk solids into a glass and allow to solidify. Cut around the disc of butter and remove. Rinse the disc of butter in cold water, making sure all milk solids are removed. Add the disc of washed butter to the rest of the clarified butter. Whisk the eggs, pour into a jug and set aside. Put the remaining ingredients into a bowl and place over a pan of simmering water. Whisk the ingredients together until the butter has melted and the sugar has dissolved. Gradually pour in the eggs, whisking the mixture vigorously so that the eggs don’t curdle on contact with the warm liquid. Keep whisking until the mixture heats up and begins to thicken. Remember, the curd will thicken as it cools, so if it coats the back of a wooden spoon when hot, that’s it. Pour into sterilised jars if you like, but I find a sturdy plastic box that I can keep in the fridge is simpler. And to be honest, despite its long shelf life, its demolished in days. P.S The deliciously crunchy, wholemeal toast in the pic is cut from a Grant Loaf. I love the versatility of potatoes and doing something a bit different with them can really brighten up an otherwise ordinary weeknight meal. Not every part of meal has to be gussied up in finery – just change one thing to make everything else that bit more special. We had these potatoes last night, with (97% pork) sausages and steamed broccoli. It was fab. 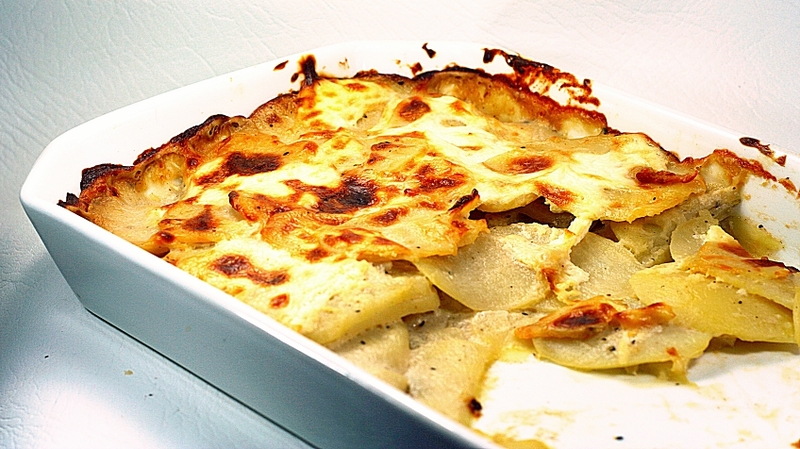 Dauphinois potatoes are a traditional speciality of Dauphiné region of France – sliced potatoes, double cream, garlic and seasonings are baked for about an hour and a half to a rich, golden finish. And there lies the downside of this delicious dish – the length of time it takes to cook. Be a bit heavy-handed with your potato slicing, and cooking time will start nudging two hours. Great if you’ve got an Aga and can set them cooking just after lunchtime – but that’s not very practical for most of us. Also, the generous use of cream makes this dish extremely rich, which then relegates it to something one might have just occasionally, as a treat. So here is my solution to both these problems. Dauphinois potatoes with all the creaminess and flavour of the original, but with a fraction of both the fat and cooking time. Ideal for busy people, as the preparation takes only 15-20 minutes, which means it can be thrown together before work. The dish can then rest during the day, to let all the delicious flavors mingle. After work, into the oven it goes, 20-30 minutes and bish-bash-bosh Vwa-as they say-La! Potatoes – Must be the floury type. Varieties to look for include Desiree, King Edward, Maris Piper. Milk – Whole milk, unskimmed, ordinary. Some might call it ‘full fat milk’ but please, before anyone starts shrieking about unhealthiness here, let’s be realistic: Whole milk = 3.7% fat, double cream = 48% fat. Creme fraiche – Low fat. Just 15% fat, before you ask. The amount will depend on the shape of your baking dish. Nutmeg – freshly grated. It’s awesome. Peel the potatoes and slice thinly. I use the thin slicing disc on my food processor. NB Do not rinse the slices. It’s the potato starch that will be giving the sauce its creaminess. Put the potato slices into a broad, heavy-bottomed pan with the rest of the ingredients except the crème fraîche. Bring to the boil then lower the heat and simmer for about 10 minutes. NB Stir gently with a spatula to avoid breaking the potatoes or letting them stick to the pan. At the end of the cooking time the slices will be coated with a creamy sauce. Taste to check the seasoning and adjust as necessary. Spoon the potatoes into the baking dish and level the top. If your timetable allows the dish to rest, cover with plastic wrap until required. To bake immediately, continue as below – don’t wait to pre-heat the oven, just put the dish in and turn the oven on. Spread a thin layer of low fat crème fraîche over the top of the potatoes. Bake for 20-30 minutes until golden brown and bubbling. Test for done-ness with the point of a sharp knife – if the potatoes are fully cooked, there should be no resistance.